Hello Songbird readers! My name is Carla and you can find me over at Hammers and High Heels. I feel very honored to be guest blogging today for Marianne because 1– I love her blog and 2– it is my very first time ever guest blogging! So I hope you enjoy what I have to share today. As our blog started to grow so did my love for DIY projects and vintage style! I’m always out looking for one of a kind finds at antique or architectural salvage stores for our home. If there is a time when I can’t seem to find what I’ve been dreaming of (or it isn’t friendly to my budget) I come up with a way to make it on my own. I’ve enjoyed seeing all of Marianne’s amazing vintage inspired decor and projects here on Songbird, so I thought it would be fun to share one of my favorite vintage inspired DIY project with you all today. Get ready for some DIY Vintage Inspired Crates! Who doesn’t love vintage crates? 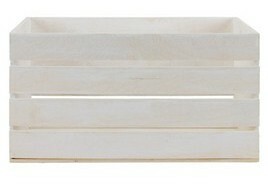 They make for stylish and simple storage while oozing with old charm. 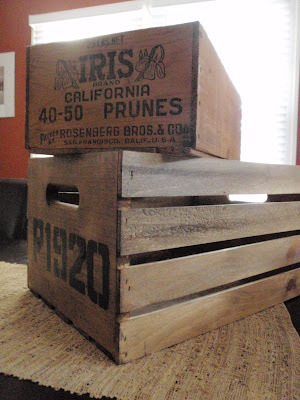 I have collected a few vintage crates from antique stores, but when it came to a certain project I had in mind I needed several matching crates- and at a budget price. So I decided to take the DIY approach and make my own! Here’s how I made them… I found these crates at JoAnne’s online for $9.99 each and ordered a few. They are basic, unfinished, and pretty sturdy measuring 18”L x 12”W x 9.5”H. 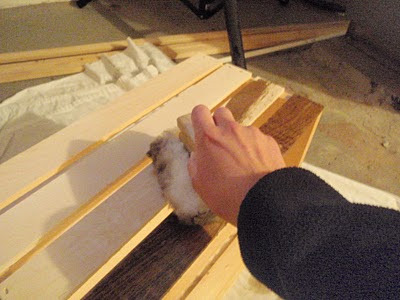 Once you have your crate, the first step is putting your dog in them staining the wood so they would have more of an antique look (because fresh from the craft store doesn’t look very chic). I used Minwax Wood Finish in Special Walnut 224. I looked at a swatch of it at Home Depot and thought that the color had a gray-ish antique shade to it AND it was only $6.69. I really liked the way the stain enhanced the wood grain detail, and made it appear more aged and unique. I think it is a good stain to use on any wood item that needs an aged look! After the stain dries, it is time to add your own letters/ numbers to the crates for a more personal vintage look. I got a stencil pack at Home Depot for $1.99, a total steal and very industrial looking- perfect! I placed the numbers and letters where I wanted and started to outline. Then it is time to paint inside the outlines. A tip for anyone that tries this, use a small tip brush. I started with something larger and it was very hard to make neat lines. So I switched to a small brush. Once you are done you have an awesome vintage inspired crate! If you are feeling really ambitious and want to tackle another project along this one, check out the tutorial for how we made a shelving unit out of these crates! I hope you felt *inspired* by this DIY project! I’d love to know what you think! I also would love for you to stop on by Hammers and High Heels, I promise it will be worth the visit! We always seem to have a room redo, DIY project, or something crazy going on (like the tornado in May that brought a tree into our guest room) but we do our best to have fun when we aren’t working on the house (stair sledding anyone?). Thank you again Marianne for letting me write my first guest post every, what a treat! Oh my goodness, so impressive. You have done a wonderful job, on EVERYTHING. My favorite is the chair covers, numbered, brilliant. That's one good looking industrial style shelving unit! Way to go. LOVE these crates! Thanks for sharing. Wow! 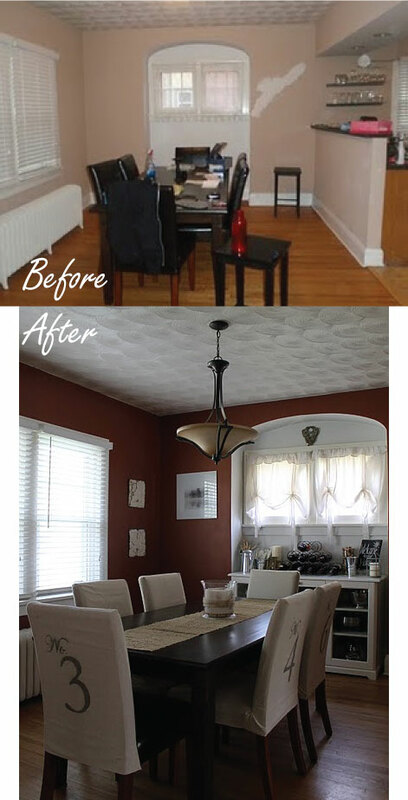 I really love the mantel re-do! 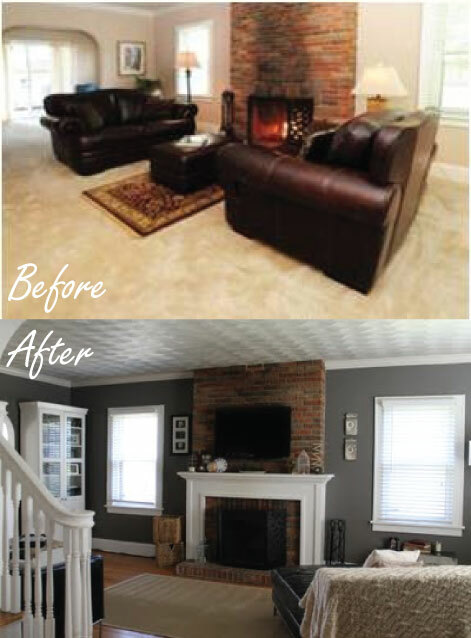 I never thought to add a mantel over existing brick- what a great design!